As consumers become accustomed to having digital experiences integrated into their everyday lives, foodservice businesses are discovering that they can increase customer engagement and enliven their bars and restaurants with technology designed to immerse their guests. Unfortunately, many businesses fail to take advantage of all the perks and promises of digital experiences by thinking too narrowly – they ignore opportunities for growth by failing to think outside the box. These tips will help your business take advantage of the entire spectrum of engagement available to restauranteurs willing to invest in digital experiences. With six dos and one big don’t, you’ll be well on your way to creating memorable dining events that customers return to again and again. For some businesses, the first instinct when it comes to digital experiences is to look for opportunities to advertise their menus or services. Yes, digital signage is an important advertising tool, especially for promoting specials and featured items. But if all you’re doing with the technology is trying to convince your customers to spend more, they will eventually learn to tune you out. Creative and engaging digital signage might be enough to satisfy your customers right now, but the opportunities to create truly immersive foodservice experiences are only growing. Retailers and restaurateurs around the world are using AR and VR to tell unforgettable brand stories, and neuromarketing is being used more often than ever to test and validate new concepts. Our own team’s work creating digital experiences for CZ Bank blended different technologies together to both test multiple concepts and offer integrated digital experiences that engages visitors and helps them navigate the space. 63 percent of consumers report that digital signage catches their attention. Put that attention to good use by connecting with your customers and drawing them into the digital experience. Options such as digital menus allow your customers to interact with a variety of offerings, and the ubiquity of mobile phones makes it easier than ever to engage with your community directly. By using a branded hashtag to incorporate customer photos and messages into the digital experience, every person who walks through the door has the opportunity to form a memorable connection with your brand. 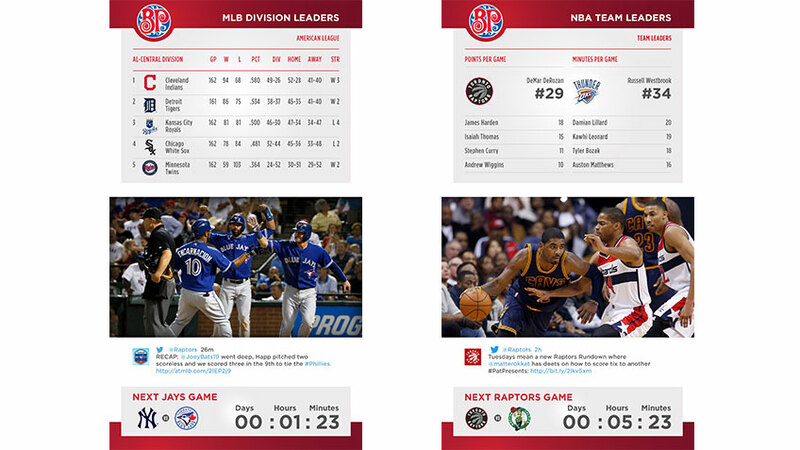 When designing an immersive restaurant/bar experience for Boston Pizza, we tapped into the sports-watching experience by incorporating dynamic, RSS-driven digital messaging with team and player stats, news, game schedules, match ups, and other useful information for sports fans. The content is pulled from a variety of news sources and automatically updates in real-time. One of the reasons that so many consumers resist large chains is because they feel inherently generic. It’s an unfortunate consequence of rolling out a winning formula on a large scale: eventually, even the most innovative concept stops feeling special. Agile digital experiences make it possible to customize the bar experience for every market, community, and consumer mood. By giving local management the authority and ability to change the content at their own discretion, you can empower them to connect better with their customer base. The technology behind consumer-targeted digital experiences is always improving and, like all technology, the frequency of those improvements is growing exponentially. That means that while you don’t need to invest in the most cutting-edge technology every six months, you will need to keep both the hardware and software behind your digital experiences as up-to-date as possible. By working with a team that understands the differences that technical changes can make to your bar or restaurant environment, you can avoid looking out of touch, out of date, and out of style. Beyond keeping customers entertained, the best digital experiences can have practical benefits as well. Digital queueing systems that reduce wait times, table-side buttons that let servers know they’re needed, and apps that allow customers to make musical requests from their phones: all of these tools allow your staff to work more efficiently and provide better service. To create truly engaging and enjoyable digital experiences for your customers, it’s not enough to invest in something trendy and hope for the best. For a real return on investment, the digital elements of your design must be implemented strategically and optimized to suit your bar or restaurant’s unique identity and personality.